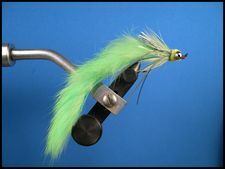 We have all heard that, "If it ain't chartreuse it ain't no use." At times that does seem to be the case. The Chartreuse Dredger was developed to compliment the Black and Purple Dredgers and to satisfy the chartreuse boys. To tie the Chartreuse Dredger use the materials listed above and follow the step-b-step tying instructions for the Black Dredger. © Copyright 2019 Ward Bean, Council Bluffs, IA, All rights reserved.